The tricky part was making sure that it still got crunchy with the pumpkin in it. Granola that isn’t crunchy just isn’t quite right. 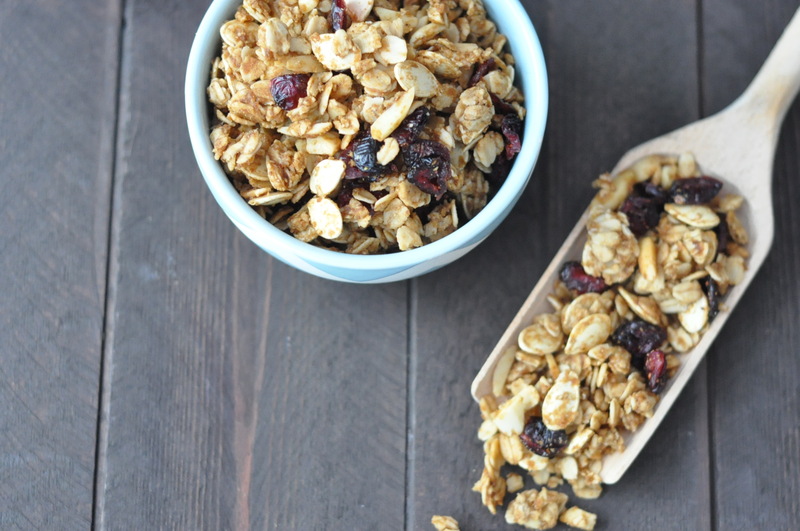 It took some tweaking and now we have a crunchy pumpkin cranberry granola. The boys certainly didn’t mind testing out the first batch, even if it was still not quite crunchy. In our house granola is fair game for anytime, breakfast, snacks, nibbling. The boys had some in their lunch yesterday. The oats and pumpkin seeds make it a great source of fiber and just enough sweet to appeal to most people. Then there is the smell, ah the smell of fall roasting in the house! Preheat oven to 300 degrees and line a sheet pan with parchment paper or silpat. Combine the oats, almonds and pumpkin seeds in a large bowl. Place everything else, except the vanilla and cranberries, in a small saucepan. Whisk frequently over medium heat and bring to a boil. Remove from heat and whisk in the vanilla, pour over the oats and nuts. Stir well to combine and place on a parchment paper lined sheet pan. **If it doesn’t seem to be drying enough bake it a little longer. **If your sheet pan isn’t big enough you may need to use two pans to ensure you have one thin layer. **I used fresh roasted pumpkin. If you do so, make sure you squeeze out the excess water. Thank you. I was extremely rushed with photos as usual! What a great granola recipe! Love this! Thanks! Perfect for the kiddos. They practically inhale it! Thank you! We certainly are enjoying it, especially on top of yogurt. I’ll have to check out the apple purée granola, sounds delicious! 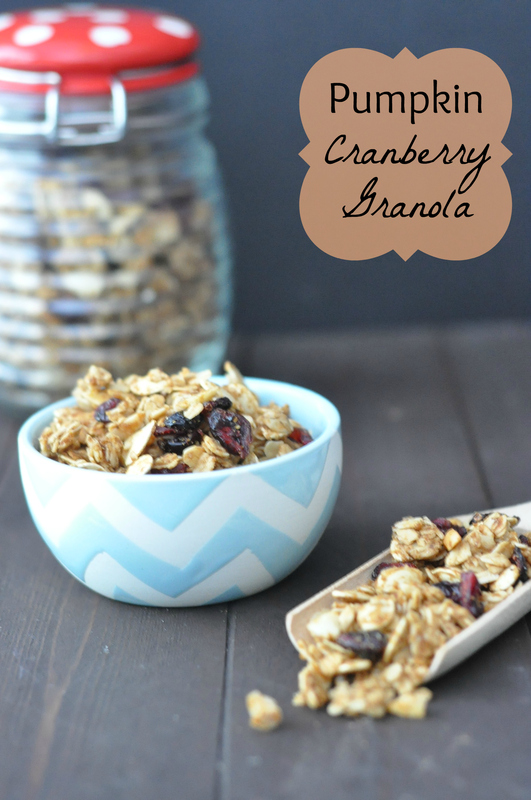 The crunchy pumpkin cranberry granola looks really nice. I love granola for snacking. I can eat it the whole day long and never get tired. I have bookmarked the recipe. Will be trying it soon. Thanks for sharing! Let me know how it goes. We snack on granola too. I never grow tired of it!